Emma is my mother’s mother’s mother’s mother. My 2nd great grandma. She is the last generation for which I have a photograph on this maternal line. This photo was in an envelope with the negative. Super cool. Now I just need to find a local place to have a print made from the negative. I wonder what details will improve in a new print. The photo and envelope have VERY different dates on them. One says about 1885, the other says about 1900. The funny part is that the handwriting looks remarkably similar as if the same person wrote both dates but on different days. 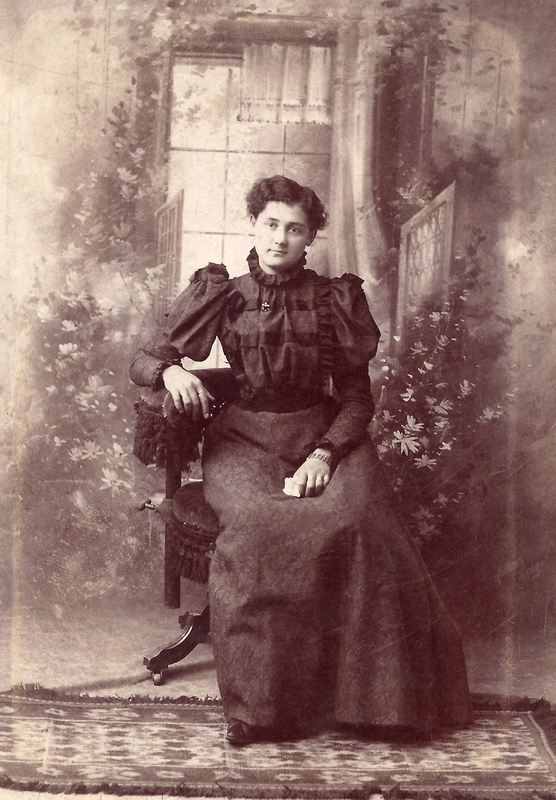 Emma was born in 1882 and married in 1901. Clearly this photo was taken many years after 1885. I zoomed in on her ring finger in photoshop. There is something there but it could be a scratch or speck or a small ring. Either way – 1900 is much closer to accurate. I’m so glad to have this photo of Emma in her youth. I think the details of her dress are lovely. She seems a bit reserved, maybe even sad. I love her wavy hair. Most of all I love looking into her eyes and thinking that she and I are two links in a long chain of mothers. Next postTwo Infinity & Beyond! I agree with the date being more like 1900, and was probably an engagement photo as was often done back then to send around to relatives with the good news. It’s a lovely photo. Hope your trip is going well this week! Oooh, can’t wait to see the print from the negative. Hopefully the negative hasn’t deteriorated and there will be more detail. You will post it, right? I’ve heard there is a place about 15 minutes from my house but I need to check out what they actually do not just what is rumored. Hopefully their good reputation is well deserved. I agree with Alex, looks like turn of the century. I’m sure is not sad. The photographer may have asked her to sit “still” without a smile. It’s not easy to smile for the entire exposure. Also she may be engaged, but wouldn’t an engagement picture have the beau in it? Not sure, but thanks for sharing the photo! Thank you. Something about her eyes is sad to me, in this and all other pictures of her. I can’t quite put my finger on it. Hopefully you are right and I’m seeing something more like boredom. 🙂 I know I have a wedding photo somewhere. I need to compare them to see the differences to help with the timeline. The dress is very much closer to 1900, than 1885, based upon the style of sleeves, bodice and skirt. Skirts in the 1880s tended to have lots of rows of decoration on the front panel. Even sitting I can tell that Emma is wearing a skirt from the late 1890s as it is unadorned and is bell shaped. The blousing at the front of the bodice is also typical of the later time period. 1880s bodices were fitted. The puff-sleeves also go along with the later date. Sleeves from the 1880s were more fitted and had very little puffiness. Also, if you have a scanner, you can probably get it to scan the negative. I have a whole envelope of 1919 negatives that I was able to scan. In your scanner’s program, you should have the ability to reverse the color. I should check that out – I haven’t played with the settings enough to see if mine does that.